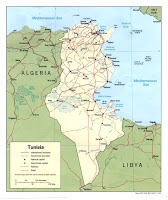 Until I Googled it a few minutes ago, I had no idea where the country of Tunisia was (turns out it was, and still is, in northern Africa - I was thinking Asia somewhere), and I know pretty much nothing about the country's cuisine. What I do know is that I have a recipe called Tunisian Vegetable Stew, and it's delicious. Whenever I'm in the mood for something that tastes different than pretty much everything else I cook, something that is loaded with interesting flavors and textures, this stew fits the bill. I got this recipe, along with a few others, from my friend John, and I must admit I was skeptical the first time I read it. Cabbage, chick peas, tomatoes, cinnamon, cayenne, currants, lemon, feta, almonds...it sounded like the most outlandish combination to me, but does it ever work. Among the many qualities of this particular dish, I really appreciate it for both its healthfulness and its ease of preparation. Start to finish it takes only about 30 to 40 minutes, making it perfect for a weeknight meal. Leftovers reheat beautifully for a wonderful lunch, just remember to bring along some extra feta and almonds. Easy, healthy, and delicious, what more do you need? Start by heating the olive oil in a large saucepan (at least 3 quart) and cooking the onion until softened, about 5 minutes. You then toss in the cabbage, sprinkle it with salt, and cook it for another 5 minutes. Add the green peppers, coriander, turmeric, cinnamon, and cayenne. Stir to combine and cook for 1 minute. You should smell the cinnamon almost immediately. Stir in the tomatoes, chick peas, and currants. Bring to a simmer, cover, and cook for 15 minutes. Stir in the lemon juice and season with salt. Serve in bowls topped with feta and toasted almonds. I'll admit that geography was not my good subject in school -- I'm glad you clarified where Tunisia is located :-) This stew looks great -- I agree that it sounds a little crazy at first, but it looks very delicious at the end -- good job!